'Once, in a place at the bottom of the ocean that is deeper, darker, further, wetter, colder, lonelier . . . than anything you can imagine, lived a piglet squid . . .' From Joyce Dunbar, author of Tell Me Something Happy Before I Go to Sleep and illustrator Tim Hopgood, (WOW Said the Owl), comes this acclaimed picture book about the wonder of just being alive. Piglet Squid spends all day smiling his big, dreamy, happy smile . . . but his friends in the deep are always so woebegone. One day, Piglet Squid embarks on a quest to find something magical to show them all . . . A quirky deep-sea adventure about a plucky little creature, determined to show his friends that there are wondrous things to smile about . . . if you look hard enough. Destined to be a storytime classic for children aged 3 and up. Perfect for everyone who loved The Monster Who Ate Darkness and Mouse & Mole. 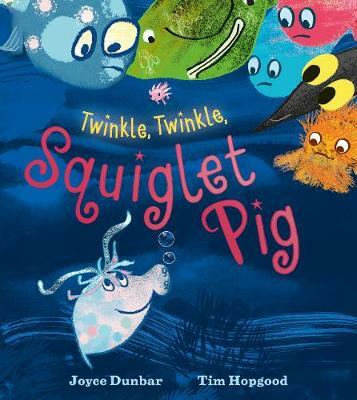 "Stunning illustrations make this story quite delightful" (BOOKTRUST) "Hopgood's quirky illustrations bring the playful text to life and you can't help but love the optimistic Piglet Squid" (THE BOOKSELLER) "A classic picture book in the making" (PRIMARY TIMES) "An ideal bedtime read" (THE BOOKBAG) "Joyce Dunbar's joy in words is matched by Tim Hopgood's exuberant rendering of the inky marine depths inhabited by stranger-than-fiction creatures..." (SUNDAY TELEGRAPH) Joyce Dunbar has written more than eighty books for children including the bestselling Tell Me Something Happy Before I Go to Sleep and the much performed Shoe Baby and This is the Star. Her series of short funny novels, Mouse & Mole, has been animated for television. She also teaches a creative writing course on the Greek island of Skyros!